The G4 gas meters are remarkably small and lightweight, yet highly accurate and reliable, even at pilot light flow rates. The G4 meter is classified as 200 cubic feet per hour (cfh), non-temperature compensated gas meter with cyclometer register and can be equipped with output for automatic reading systems. 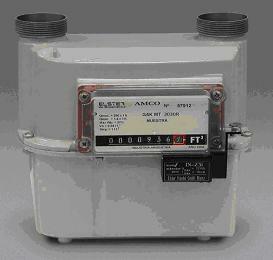 The G4 is manufactured by American Meter Company.